The Cambo Wide series of cameras are interesting as landscape photography options for film users and my choice as a naturally-inclined wide angle photographer is the Cambo Wide 470. 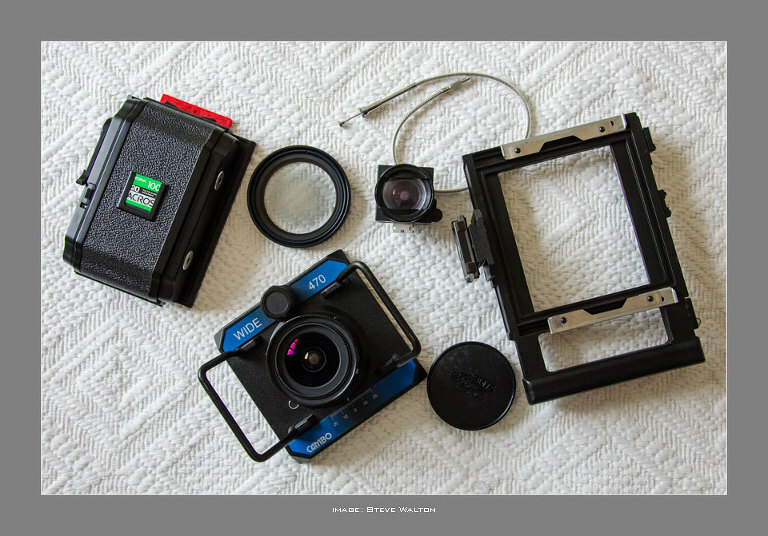 Essentially these are 5×4″ format with most of the usual movements omitted for the sake of compact design, helicoid lens focusing and universal fittings for roll film holders from 6x7cm, 6x9cm and 6x12cm mean that they can almost be used as point and shoot cameras. On Cambo Wide cameras the only movements available are, depending on orientation of the camera, lateral and rise and fall of 20mm each way. The reality with wide angle lenses is that these movements are mostly all that are needed. I use my Cambo Wide 470 exclusively with a 6x12cm roll film holder, I like the 2:1 aspect ratio of the format and the Schneider Kreuznach Super Angulon 47XL that is fitted in my Cambo Wide 470 is a legendary lens. Whilst such an extreme wide angle field of view (equivalent to 14mm on 35mm film or full frame digital) might not be to everyone’s taste, I have a preference for wide angle lenses, especially with cropped ‘panoramic’ formats such as 6×12 and 6×17. 6x12cm is an easy and, to me, natural format to compose with. It makes high quality double page spreads in square books and large prints are beautifully detailed. The Cambo Wide, despite being stripped to the bare essentials for landscape photography is still a heavy and bulky camera in the backpack. Stripped of unnecessary functions and associated fiddling under a dark cloth, it is a camera that encourages the photographer to concentrate on making images when those moments of light and shadow combine briefly. 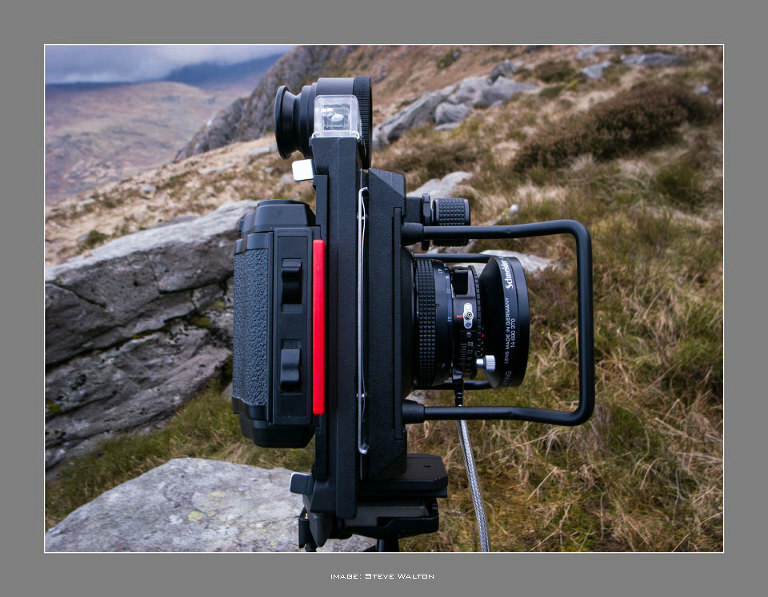 Cambo Wides seem to be appearing on auction sites and used equipment lists regularly at reasonable prices and are capable of producing beautiful quality images. Cameras aren’t made any more durable than this. A Cambo Wide 470 may not be pretty, but it certainly does the job it is intended for although weight is the penalty. Helicoid lens focusing is a major advantage and zone focus is easy with the Super Angulon 47XL. 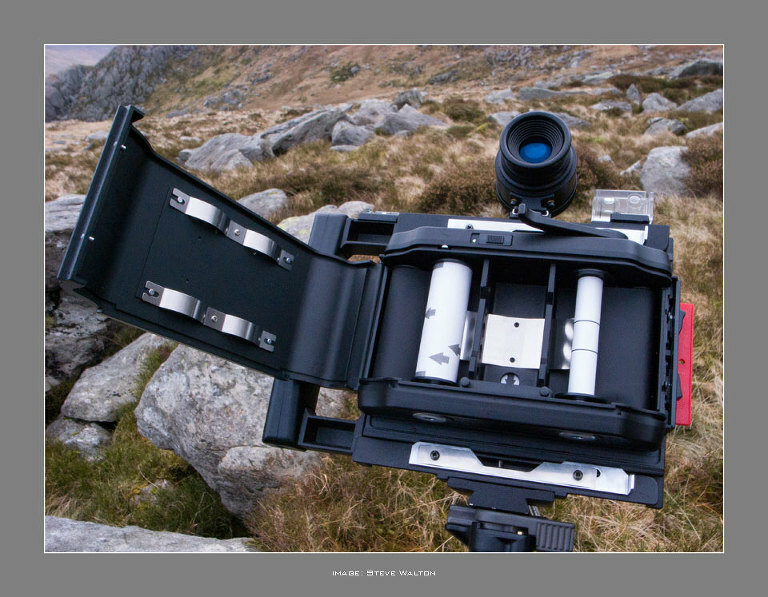 Although it is a 5×4″ format camera, I use a Widepan 6x12cm roll film holder most of the time on my Cambo Wide 470. This give 6 frames on 120 roll film and I have found the combination of this format with Ilford Delta 100 film and the Super Angulon 47XL lens gives beautifully detailed negatives that will print to very large sizes. The Widepan back is very similar to Horseman backs in materials, quality and construction and from my experience it’s also cheaper to buy a Widepan back new compared to the cost of a used Horseman back. 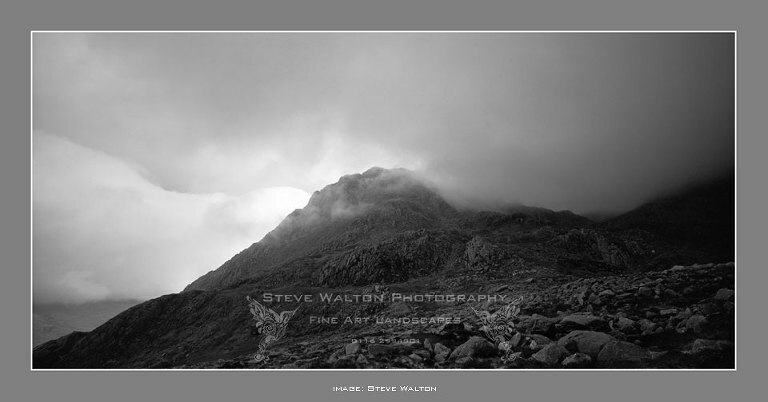 This image of the western aspect of Tryfan in Snowdonia was taken on a particularly bad January day, with sleet and rain, low cloud and very dull light. The SA 47XL lens suits my preference for moody, wide angle monochrome landscapes. This weather is often typical of the area and with a strong gale blowing at the time, it was only a matter of time until the failing light did something interesting just as the next squall arrived from over the Glyderau. The Cambo Wide has the extra advantage of being packed away quickly. if I need to do this I clip a lightweight Exped drybag around the camera, take it off the tripod and put it straight into the backpack out of the weather with no folding or other fiddling required. The component parts of the Cambo Wide 470 illustrated here for when using 120 roll film are quite basic. The body frame has graflock type clamps for the lens assembly and ground glass (or roll film holder as shown), with integral right hand grip and cable release. Cold shoe mounts for spirit level and the external viewfinder and a foot on the base with a 1/4″ thread for mounting on a tripod comprise the frame. The viewfinder has interchangeable plastic masks to suit the chosen format and there is a dedicated centre graduated neutral density filter to counter the considerable wide-angle fall off towards the frame edges. I prefer to leave the nd grad off when using black and white film as I like the vignetting, but it becomes necessary to use the centre nd grad with transparency film when the effect is strong enough to be detrimental to the image. The Super Angulon 47XL is mounted in a helicoid to make hyperfocal distance focusing as easy as with any other manually focused lens. The lateral shift is operated by turning a knurled knob with locking ring on a rack and pinion. The lens moves very smoothly and the degree of shift is read against a scale on the lens mount. Ilford Delta 100 (developed in ID11 1:1) is my preferred film for medium format unless I want long exposures in excess of 2 minutes or more when I’ll use Fuji Acros 100. I like the pictorial qualities of Delta 100, sharpness and lack of grain is astonishing and it is a much more forgiving emulsion that Ilford PanF with extreme contrast. With such a large original size as 6x12cm very big enlargements are possible, but smaller prints have a smoothness, luminance and tonal range that is a delight to behold. Flare resistance of the SA 47xl is impressive, the contre-jour image above would have produced significant flare with many wide angle lenses, almost certainly if I’d used the Fuji SW 90mm on 6×17 or the Nikon 14-24 on FX digital but there is not a hint of flare here even with a 82mm Heliopan O22 filter in place. The SA 47xl is such an extreme wide angle lens (equivalent to 14mm on 135) that it often requires moving in really close to the subject. I had several entertaining minutes with this old beech tree at Bolehill, it’s peculiar low growth and spreading boughs attracted me and made a convenient ‘filler’ for the rather bland sky. A sudden movement amongst the rocks in the foreground not six feet away caught my eye. It was a weasel carrying a field mouse it had obviously just killed. I remained perfectly still and the weasel seemed to be oblivious to my presence. Stoats and weasels are beautiful creatures, ferocious predators and quite mesmerising in their movements. This one was inspecting every nook and cranny amongst the rocks. Eventually, it suddenly became aware of me and disappeared with it’s prize. A magical few moments observing animal behaviour, moments which are always a bonus for landscape photographers. Back to the beech tree: I used Ilford Delta 100 in the Widepan 6×12 back. I use my Cambo Wide 470 almost exclusively with a Widepan 6×12 back. I have posted a user report about this Chinese-made alternative rfh on Hard Light, my outdoor blog. Please click on this link to read my review. The Devil’s Quoits, a henge and stone circle in Oxfordshire. Cambo Wide 470, SK SA 47mmXL, Fuji Acros 100 in RO9, Heliopan O22, Widepan 6x12mm rfh. I was wondering where you got the cable release on the Isolette?